Telecanter's Receding Rules: What are the Monsters Doing? 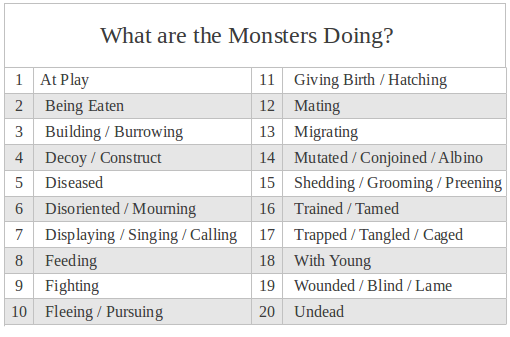 I agree that this type of table is awesome, but I feel like it is not applicable to every monster type. My wish is for every monster written up to have a personalized table of this type- maybe 1d6? Like, included in the monster manual entry that is. I think a little behavior table should just be part of creating a monster. I am so using migrating gelatinous cubes. Beautiful. Also yellow molds, lurkers above, doppelgangers. of course, that's why they hate the tumbling dungeon. Unless it's like a fairground ride for them. Thanks a lot Elber. Depending on how you spin it as DM I think they could be odd/frightening incidents too. Imagine the party realizing they are surrounded by 20-30 slowing moving gelatinous cubes. Also thanks for the link. I notice I caught some of the same possibilities (pursuing/fleeing) but that chart is more aimed at sentient humanoid/demihumans. I think we might create those folk a chart of their own. @Harlo: You could absolutely do that. A generalized chart like this, by its very nature, will miss some of the specificities possible. But I didn't make it only to save the work of coming up with individual monster charts. From my experience a chart like this is generative. You take the table of things you expect goblins to do and then you overlay it onto a different monster to see if it makes sense. And in making it fit you can come up with stuff you probably would have never thought of. I never in my life thought of gelatinous cubes migrating or zombies gettin' it on before making this chart. (That's why in my examples I kept coming back to gelatinous cubes, they are so odd, that they seem a true test of whether the generic entries could be applicable across the board). I think it could be a good way to have our cake and eat it too, as well. You make your very rational random encounter chart, you craft it to make sense. Then you have this improv helper that comes into play after the players have encountered a couple of "normal" encounters. Heck, you can even engage the players here: "What would a roper at play look like?" get everyone involved, make stuff. If you are worried about those specifics that may be lost for certain monsters, you could cook them into your rational encounter chart. @richard: How would molds migrate? Clouds of terrible spores drifting. On the backs of rustmonsters, maybe.